All these spare Guard models, what to do? Traitors would be a cool enemy for my Guard and Marines. Very "fluff", very appropriate to the setting. "Just make them Traitor Guard" is the common suggestion if the Lost and the Damned or the old Chaos Cult armies are ever brought up. "Just make them Traitor Guard." But how's that done effectively, then? Would Commissars and Stormtroopers be present in a Traitor Guard army? Not likely. They'd be the first taken down or the first to retreat and regroup if their companies started going sour with Chaos. When it comes to the "fluff" of the 40K universe, it would be cultists and traitors and renegade guard that would be the major problem and at the heart of most of the conflicts in that setting. Even seeing a Space Marine is a rare occurence, a Renegade/Chaos one showing up would be that much more rare. It's a numbers thing. Eldar and Dark Eldar raiders a nuisance, but survivable. The Tau may be expanding, but their pocket of the galaxy doesn't even rate the word "pocket" in size. The Orks are a massive problem, there's no real way of knowing how many Tyranids are on their way and the Necrons could be any and everywhere, but we're talking Chaos. 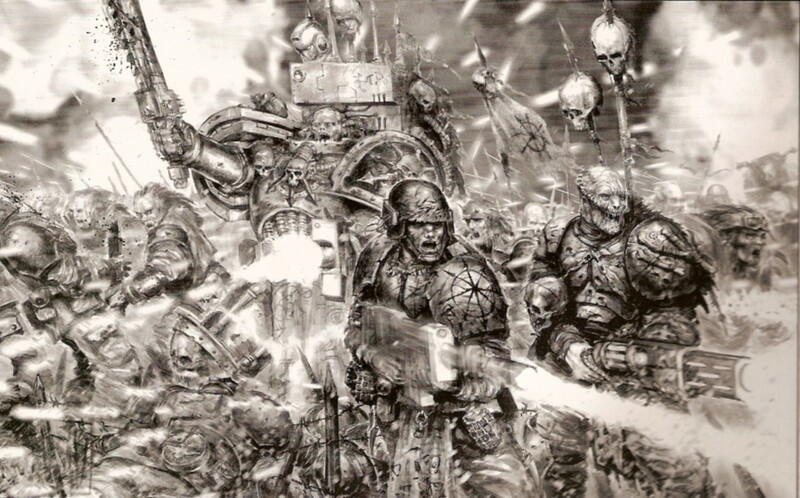 With the quadrillions of people that populate the Imperium, the Inquisition, Space Marine Chapters, the Sisters and the Imperial Guard would have their hands full mostly with putting down Chaos corruption and rebellion from within. Plus, with all those planets in "The Eye" and nearby other tears between real space and the warp aren't spilling over with Chaos Space Marines. They'd be the ruling minority amidst throngs of cultists and militia and Guard-gone-bad. 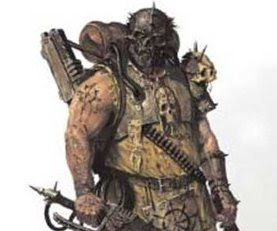 I've looked around online and there are a few decent army lists out there for bringing the Lost and the Damned up to date for 5th ed 40K, and it would be easy enough I guess to throw some spikes on the models, step back and say you have Traitor Guard... but I think there ought to be an army list. (Actually they should have their own small codex probably) So, using the 5 relevant codexes from 1996 to the present day I'm going to piece together a viable and hopefully fair army list for Traitor Guard. I'll post it here soon!